Here’s the ultimate recipe for buttery and luscious Dal Makhani. This dal is usually made with black urad dal and kidney beans (rajma), and today I’m showing you how to make this dal on the stovetop, traditional pressure cooker and an instant pot. All three methods will give you the perfect dal makhani! Here’s the thing with super popular recipes. Everyone loves it and everyone has a particular taste that they look for in the recipe. And I’m hoping to do the unthinkable today and try and win everyone over with this simple recipe! 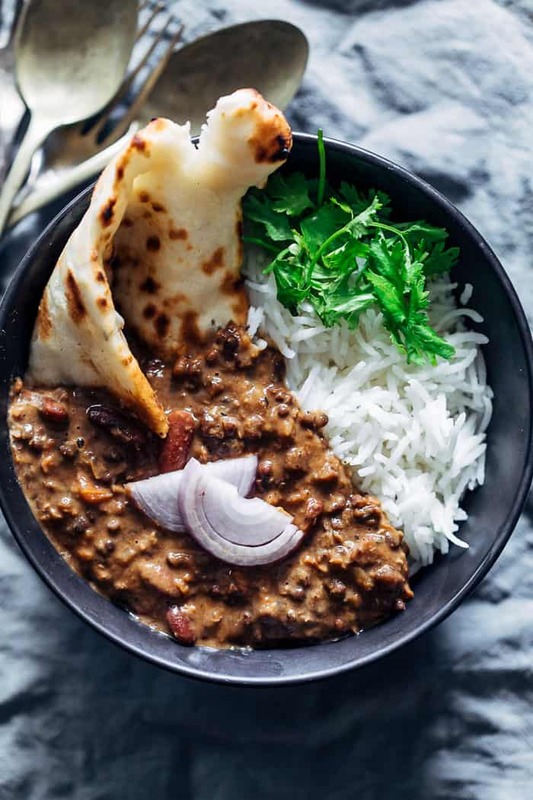 Traditionally, dal makhani is a labour of love, slow cooked for hours on hot coals, usually overnight till the dal breaks down on its own to a buttery, creamy consistency. But we don’t have that kind of time do we? We have to get to work, send kids to school and get some Netflix time in between. So I decided to test out versions of this recipe which will give you the same flavours and the same consistency but with less than half the time. It’s still a slightly long process so I recommend saving this one for the weekend and taking it on as a project. Make a big pot so that you can indulge for the rest of the week, and make extras so you can share this with neighbours – trust me, this dal makhani will win you all the brownie points! This recipe takes up to two hours to make, but let that put you off, because most of that is hands off time. It’s just the time we need to give for the lentils to break down, for the flavours to mingle, and for things to reach a point where you can smell the deliciousness. Dal Makhani is traditionally made with whole black urad dal (black lentils) and rajma (kidney beans). There are many recipes which will tell you otherwise, and ask you to use any lentils available to you. But if you are taking the effort to make something like this, its worth an extra trip to the store to buy the right ingredients for this recipe. If you stay in the U.S. or outside India, all Indian grocery stores carry these lentils. 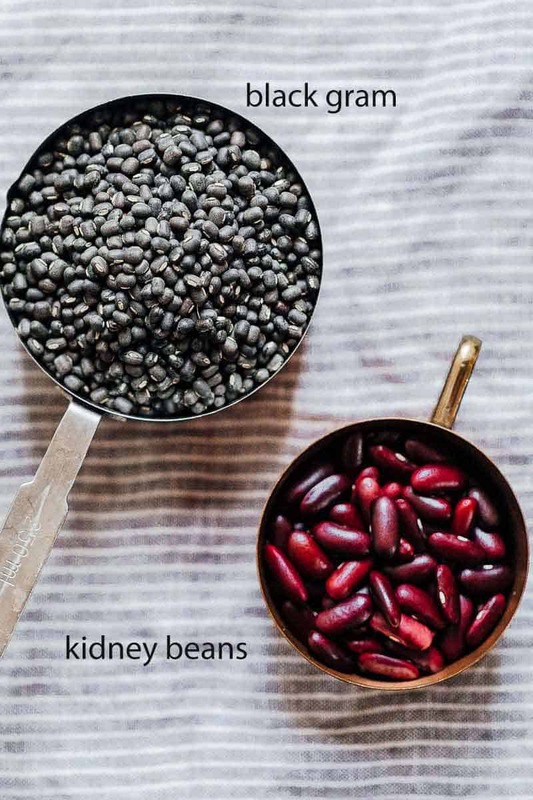 You might be able to get your hands on cooked and canned kidney beans, but you’ll still have to cook the whole black urad dal from scratch. Cooking the kidney beans along with the other lentil, also helps marry the flavours better. Using canned kidney beans won’t cut down the time in this recipe, and it’ll probably cost you more, so I recommend using dry lentils that you cook from scratch. 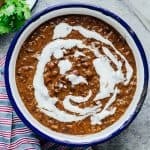 Can Dal Makhani be made Vegan? The traditional recipe uses a ton of butter and ghee which also lends it the creaminess. But if you are vegan or lactose intolerant, you can still enjoy this dal. Use 1/4 cup cashew cream while simmering the dal, and 1/4 cup coconut milk in the end. The coconut milk might add a milk coconut-ty flavour, but the quantity is so small that you’ll barely notice it. I’m sure you’ve noticed that restaurant style dal makhani usually has a distinct smokiness to it and you can easily recreate it at home. You just need a small piece of charcoal (or lump charcoal as its called in the U.S.) and either oil or ghee. Right in the end, when the dal is ready, heat up the piece of charcoal on an open flame or grill and place it in a small heat proof bowl. Pour a tablespoon of ghee or oil in the bowl, and you’ll immediately hear a sizzle and smoke coming out. Place the bowl in the middle of the pot and cover it. The smoke from the bowl will smoke the dal makhani and give it the distinct smoky aroma that we all love so much! I also have a slow cooker dal makhani recipe on the site that you can check out, but cooking this recipe in a pressure cooker really cuts down the time and effort! 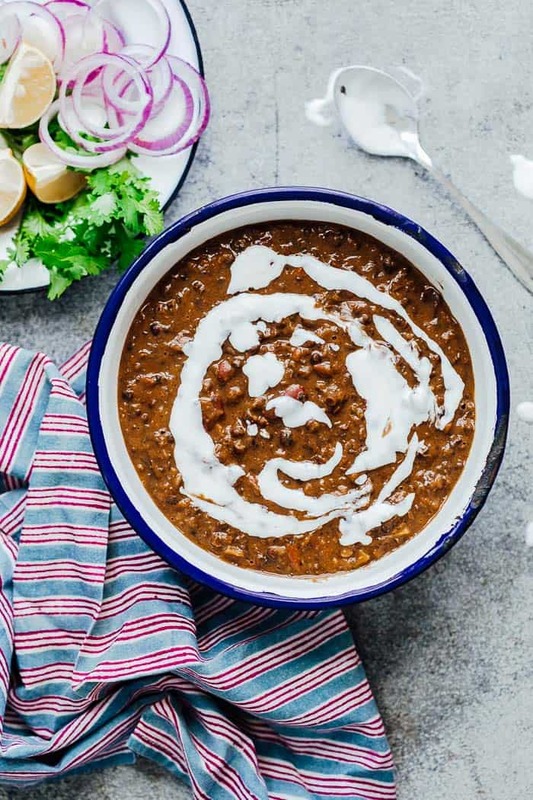 This is the ultimate recipe for dal makhani – a buttery, luscious lentil curry. The lentils are cooked in an onion, tomato mixture and finished with a lot of cream. This recipe is a weekend project, but it’ll make you enough that leftovers will last you a few days. Soak urad dal (black gram) and rajma (kidney beans) in enough water that there is an inch over, for at least 8 hours. Drain the water from the soaked lentils and add them to a pot 1/2 teaspoon salt and 4 cups water. Bring this to a boil and then reduce the flame to a simmer. Cover and cook for an hour till the beans can be easily smashed between your fingers. Once the beans are cooked, lightly smash them with a potato masher, making sure to leave them partially intact. Heat ghee in a pot and add bay leaf, cinnamon, cloves and cardamom. Saute them for a minute or two till you can smell the spices and add garlic, ginger, green chilli and onions to the pot. Cook this till the onions turn translucent. Add the tomatoes (or tomato puree), red chilli powder, salt and garam masala. Cook till the tomatoes are mushy, and add the cooked lentils with 1 cup water. Bring this to a boil and then reduce to a simmer. Cook for 20 minutes or till the dal has thickened, making sure to stir occasionally because the dal tends to stick to the bottom. Mix in the heavy cream, butter and kasuri methi. Switch off the flame and let the dal makhani rest for 15 minutes before serving, topped with more cream. Dal Makhani is ideally made the previous day to let the flavours mingle. Heat ghee in the pressure cooker and add bay leaf, cinnamon, cloves and cardamom. Saute the spices for two minutes till you start smelling them. Add garlic, ginger, green chillies and onion. Saute till the onions become translucent. Add tomatoes, chilli powder, salt and garam masala. Cook the tomatoes till they become mushy. Drain water from the lentils and add them to the cooker along with four cups fresh water. Pressure cook for at least 45 minutes or 8-10 whistles. Let pressure release naturally. Open the lid, and mash the lentils partially with a potato masher. Simmer the dal for another 20 minutes till it thickens up. Mix in the heavy cream, butter and kasuri methi. Let the dal sit for 15 minutes before serving. Switch on the saute function and add ghee, bay leaf, cinnamon, cloves and cardamom. Saute the spices for two minutes till you start smelling them. Drain water from the lentils and add them to the pot along with three cups fresh water. Cancel the saute function and turn on the pressure cook or manual function. Set the timer for 45 minutes and pressure cook on high. Release the pressure manually after 10 minutes, or let the pressure release naturally. Open the lid, and mash the lentils partially with a potato masher. Switch on the saute function and simmer for 20 more minutes, stirring once or twice to avoid the dal from sticking to the bottom. The dal will start to thicken as it simmers. Mix in the heavy cream, butter and kasuri methi. Switch to keep warm mode, and let the dal sit for 15 minutes before serving. To smoke dal makhani, start by heating the charcoal till its red on an open flame or grill. 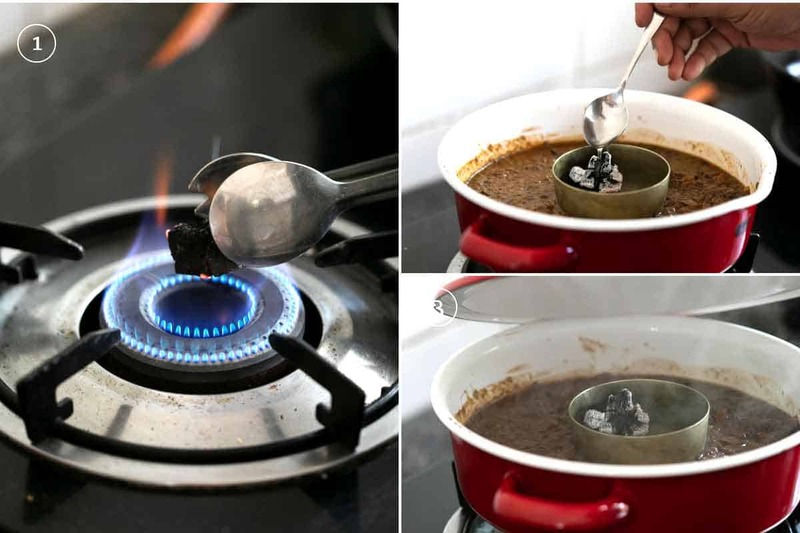 Place a heat proof bowl in the middle of the pot of dal makhani and place the hot coal in it. Pour oil on the coal and cover the entire pot with a lid. Let the lid be covered for 5-10 minutes to smoke the dal. This was genuinely delicious. I like the way you advise to do the recipe properly and use dried urad dal and rajma. Thanks James – really glad you liked it. I just made this to warm us up on a snowy day and boy did it satisfy! I used the IP recipe and followed it pretty closely. The texture was rich and creamy. I served it with phulkas and jeera rice. It was loved by everyone from my 68 year old dad and my 4.5 year old daughter. This recipe is a keeper! I and my husband love Indian food and Dahl Makhani is a winner for both of us. I have tried many times but failed. Now I have my pressure cooker I have made butter chicken, goat curry, various veg. curries and now girding my loins to try this. Thank you for making it seem so easy and for the “smokey” hint, which we have always loved. Will let you know how I go. Dal Makhani is such a weakness of mine. I hope you give this a go and like it! Let me know if you try it. I have always been passion to make Dal Makhni, but had no idea how to make it in a professional way. It looks too eye catchy and delicious. But still i don’t understand why you use Charcoal here, What is the reason behind here. But Really nice work on it. Oh, man. This was a million kinds of delicious. And the recipe was easy to follow. I’m definitely going to make this over and over and over again. Thanks so much Gauri! So glad you liked it! Thanks for all the amazing tips! And the 3 methods all have their perks–no excuse not to have your wonderful dal on the menu very soon! I had never made anything like this before but you can bet I will make it again! So good and quite easy to make!